The Peruvian theologian Gustavo Gutiérrez was known as the father of liberation theology. 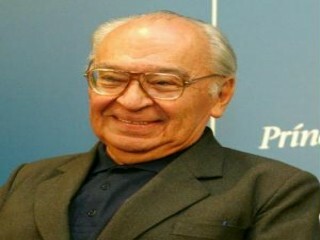 Gustavo Gutiérrez was born in the Monserrat barrio of Lima, Peru, on June 8, 1928. He was a mestizo, part Hispanic and part Quechuan Indian. He had polio as a boy and spent most of his teenage years in bed. This experience motivated him to begin training for a career in medicine, but along the way he decided instead to become a Roman Catholic priest. Because of his outstanding work in theology, the church sent him to do graduate work in Europe, at Louvain (Belgium), Lyons (France), and the Gregorian (Italy). On his return to Lima to begin work as a priest and teacher, he discovered that the "classical" formation he had received in Europe had not equipped him to deal with the needs of the poor and oppressed in Latin America. Three discoveries in particular were important. First, instead of seeing poverty as a "virtue, " or at least something to be accepted by Christians, he came to see poverty as something destructive that must always be opposed. Second, instead of seeing poverty as the result of laziness or bad luck, he came to see it not as accidental but structural, something that society conspires to ensure, so that there will always be enough poor people to keep wages down. Third, instead of accepting poverty as inevitable, he came to see that the poor were a social class and could organize to bring about change. Re-reading the Bible in the course of making these discoveries, he realized that the God of the Bible makes "a preferential option for the poor, " rather than (as the institutional church so often implied) for the rich. God loves all persons, but has a special concern for the victims, and sides with them in their struggle for justice. The true concern of both the Bible and the Christian tradition, Gutiérrez came to feel, is the promise of liberation, a three-fold liberation from unjust social structures, from a sense of fate, and from personal sin and guilt. These concerns received his powerful expression in what became the most influential theological work in the 1970s and 1980s, A Theology of Liberation (1971; reissued with a new introduction in 1988). The prominence of this book led many to describe GutiÃ©rrez as "the father of liberation theology, " a description he disavowed because, as he insisted, a theology of liberation is not the work of the experts but of "the people, " meaning the poor people for whom he was simply the one to write a book about what he had learned from them. The main themes of liberation theology are congruent with the themes of the Christian tradition, save that they are always seen "from the underside of history, " namely, from the perspective of the poor and oppressed. There has been "an irruption of the poor" challenging the unjust structures of society and the church when either becomes a defender of the status quo rather than the champion of its victims. God is the God of the poor, Jesus Christ is "God become poor" in a Galilean carpenter, and the Holy Spirit is the power of God on the side of transformation. All this is particularly evident in the "base communities, " small groups within the church who combine Bible study with involvement for change. Over a hundred thousand base communities sprang up in Latin America in the 1970s and 1980s. Because liberation theology means, among other things, a challenge to the authorities, there was heavy opposition from those same authorities. Those holding power killed thousands of priests and lay people for siding with the poor and seeking to improve their lives. Gutiérrez himself was attacked from within the church by those who did not want the church to be on the side of change. A familiar charge in the 1970s was that he and liberation theologians like him were Marxist, seeking to transform Christianity into nothing but left-wing politics. The charge was unpersuasive to any who had actually read his writings or examined his life, and by 1990 this criticism was receding from the scene. Gutiérrez was essentially a parish priest in Rimac, a slum area of Lima near where he grew up. But his writings made him a world figure, and he occasionally visited the United States and Europe to speak and teach. The fullness of the faith he thus communicated was further evident in such later works as We Drink From Our Own Wells (1984), in which he described a "spirituality of liberation" and argued that the two terms could not be understood apart from each other. His book On Job: God-Talk and the Suffering of the Innocent (1987) distinguishes two types of "God-talk, " prophetic language about God that stressed the need for justice in human affairs, and mystical or contemplative language addressed to God, a language of praise and relationship. He contended that the two forms of speech were essentially one. While his later writings were less overtly "political" than his earlier ones, they nevertheless served to make the basis for political involvement increasingly firm. They mined the resources of scripture and tradition for fuller understanding of the God of the Hebrew prophets and of Jesus Christ, a God who, rather than being remote and uninvolved, is found "in the midst" of the world and the suffering of God's people. Thus, Gutiérrez affirmed that human effort for social justice contributes to laying of the groundwork for the Kingdom of God, which is ultimately God's gift rather than a human achievement. Gutiérrez spent 20 years writing Las Casas: In Search of the Poor of Jesus Christ, the story of the early Spanish missionary Bartolome de Las Casas, which was released in the mid-1990s. During this time he also alienated some Peruvian feminists by saying that feminism was alien to Latin America. Critics argued that this showed he was losing touch and dividing communities. Although a professional theologian, Gutiérrez wrote in a style that can be understood by lay people. His book The Truth Shall Make You Free (1990) is an irenic account of his faith, in response to the many charges made against him by the Vatican. We Drink From Our Own Wells draws deeply on the Catholic tradition of spirituality, and On Job is a careful excursion through one of the bestknown books of the Hebrew Scriptures. Part 4 of A Theology of Liberation is still the best and most detailed setting-forth of his thought. Robert McAfee Brown, Gustavo Gutiérrez: An Introduction to Liberation Theology (1990) is a full interpretation in English, and Arthur McGovern, Liberation Theology and Its Critics (1989) positions Gutiérrez clearly within the broad spectrum of liberation concerns. View the full website biography of Gustavo Gutierrez.